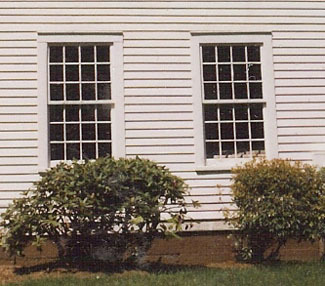 Few architectural elements generate more misinformation than historic wood windows. Paul Marlowe shares knowledge gained from years of practice in this article published in a recent issue of Traditional Building Magazine. Regardless of what you may hear from the "window replacement industry" and their sales people, current wood window restoration technology makes the continued use of period windows practical and energy efficient. Inevitably, historic wood window sash is vulnerable to maintenance problems after a century or more of rough handling and relentless exposure to the elements. Before you discard your historic wood windows, however, you should consider the long term costs of opting into the window replacement cycle. Replacements, regardless of their "lifetime guarantees", are only meant to last 15 or 20 years before their mechanisms fail or their sealed glazing units fog. The overall long term cost of restoring your period windows is less than periodic replacement because of their proven ability to outlast them many times. Of course, energy efficiency and ease of operation must be a part of any calculation of costs and benefits. We have perfected the installation of high tech weatherstripping into period window systems so that they are as snug and easy to operate as when they were first built. By carefully refitting the sash in the frames and resetting the glazing we can usually eliminate most of the air infiltration. We strive to keep up with the latest techniques and materials for retrofitting historic units. A properly fitted, glazed and weathersealed window equipped with a high quality storm window, inside or outside, will meet modern standards for energy efficiency. It has been said that eyes are the windows of the soul. Windows, of course, are the eyes of a building and no historic building is quite the same after having its eyes plugged with replacement units. Few architectural elements generate more misinformation than historic wood windows. Before you commit your building to the window replacement cycle, you may find it helpful to read an article on the subject, on which we collaborated, originally published in the "Building Arts Notebook" of Traditional Building Magazine.